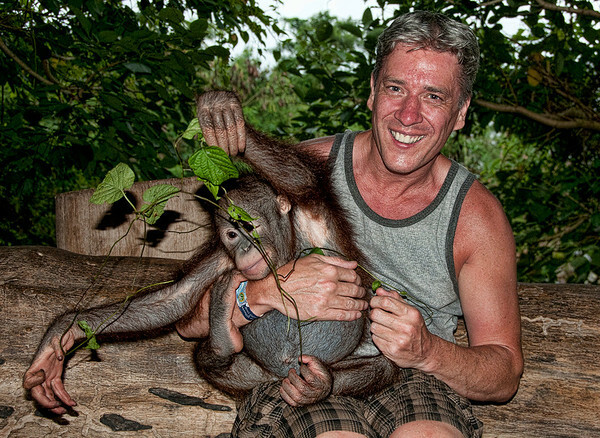 That's me on the left, closest left, the other ape is a two year old Orangutan called Nilo, we met on a recent trip to Indonesia. Born and raised on a houseboat on the river Thames, just outside of London. I grew up in and around nature, with a great love for animals, rescuing many from the river and the local resident foxes, the obvious career choice for me should have been a Vet. My first camera was given to me as a Christmas present back in the late 70s’ it was a Kodak instamatic. I still have some of those first photographs tucked away in a box somewhere, most are pictures of Christmas presents, ducks, geese and members of my family & friends, but no Pulitzer winning images. As a teenager I was given my first SLR by my mother, who is also a successful photographer, it was a Petri, a Japanese camera still popular with enthusiasts & street photographers today. This was the camera I would use through school and eventually to pass my photography O’level. Photography was not an immediate career choice, instead choosing to work in the animation industry, working for companies like, Disney and Amblin on projects such as ‘Who Framed Roger Rabbit’ & ‘American Tail’. As well as a photographer, I now work as a Technical Author. Typically photographers are told to specialise in one area of photography, I’ve tried to gain as much experience in as many areas as I can, shooting portraits, weddings, photojournalism, nature, landscape, sport, performing arts and travel. I would like to develop as a photographer organically, not forcing myself to choose a particular style or genre. I have just completed a successful commission for a theatre school, their annual gala performance presented many new challenges to overcome, but I was rewarded with a wealth of new experience. 2016 promises to be an exciting year for me photographically, I am receiving more and more offers of work in various areas, I already have some weddings, events and portrait shoots lined up, as well as various personal projects to complete. I aim to gain some experience in fashion photography and develop my skills further within the sports industry. I invite you to follow my progress as I develop as a photographer, maybe I could even capture a special moment in time for you.